HURRICANE, W.Va. — Farmers Bancshares, Inc., the parent company of Farmers Bank and Savings Company, headquartered in Pomeroy, Ohio, celebrated its grand opening with a ribbon-cutting ceremony at its new state-of-the-art banking center at 3572 Teays Valley Road in Hurricane, W.Va., on Friday, May 11, 2018. This is the first full-service banking office for Farmers Bank in Putnam County. 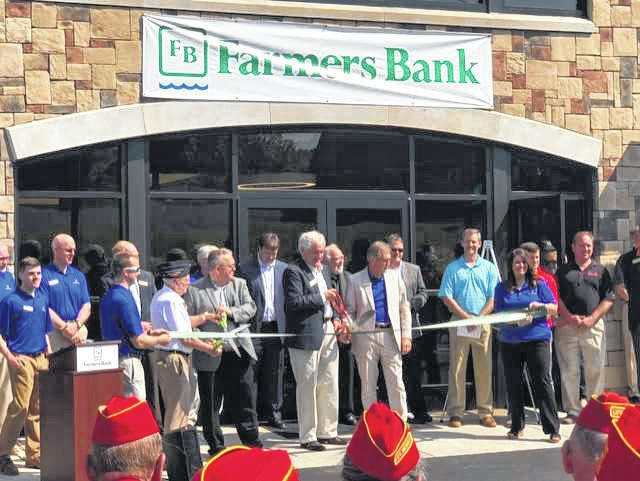 Farmers Bank had operated from a temporary banking office in Teays Valley since mid-2017 while the new full-service banking center was under construction. The new Farmers Bank banking office in Teays Valley is located adjacent to Woodclyffe Chase on State Route 34. The bank lobby will be open Monday through Friday from 9 a.m. to 4 p.m. The banking center has four drive-through lanes open Monday through Friday from 8 a.m. to 6 p.m. and from 8 a.m. to noon on Saturday. There is also a 24-hour drive-through ATM on site. The 10,000 square-foot banking center was specifically designed and tailored to fit the Teays Valley site and will provide a comfortable environment including a coffee shop, a 2,500 square foot community room available for use by local groups and organizations, as well as an outdoor patio area. On hand for the grand opening celebration was special guest and World War II Medal of Honor recipient, Woody Williams, who kicked off the dedication by raising the United States flag accompanied by members of the United States Marine Corps. Roy Hamilton, Farmers Bank Teays Valley manager offered remarks alongside other guest speakers including Ashley Alford, president of the Putnam County Chamber of Commerce, Paul Reed, president and CEO of Farmers Bank and Mike Lieving, president of Farmers Bank West Virginia division. Charles “Sonny” Williams, pastor at the Teays Valley Church of the Nazarene, offering a closing prayer. Submitted on behalf of Farmers Bancshares, Inc.